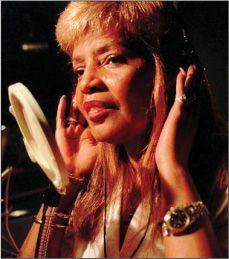 Songwriter Sylvia Moy had only just joined Motown Records in 1964 when label boss Berry Gordy called a meeting of producers and executives to decide the fate of one of its young stars. Thirteen-yearold “Little” Stevie Wonder had topped the charts in 1963 with “Fingertips,” but 18 months later his contract was on the verge of being terminated. “Stevie’s voice had changed, and they didn’t know exactly how to handle that,” recalled Moy, who asked to take over songwriting for Wonder. “I was finally told, ‘Well, if you can come up with a hit on him, we’ll keep him.’” Moy did more than that. With collaborator Henry Cosby, she composed a string of smashes—including “Uptight (Everything’s Alright),” “My Cherie Amour,” and “I Was Made to Love Her”—that transformed Wonder into a soul icon. “I just believed in him,” explained Moy. Born in Detroit to an appliance repairman and his homemaker wife, Moy was a musical child, said The New York Times. She recalled how she “played the piano on the radiator and made musical instruments out of cardboard boxes.” She studied jazz and classical music in high school, and trekked to New York City to pitch her songs to record labels. She found no takers. “You’re not a bad singer,” one executive told her, “but you will never be a songwriter.” Then in 1963, Moy was singing at a Detroit club “when Marvin Gaye heard her and recommended her to Motown,” said The Times (U.K.). She signed a recording and a songwriting contract, but was asked to focus on the latter, because the label had a shortage of material. Working with Wonder, Moy asked him to play some of his new tunes. Only one phrase jumped out: “Baby, everything is all right.” Moy went home and, with Cosby’s help, turned it into “Uptight (Everything’s Alright),” a No. 3 hit in 1965.